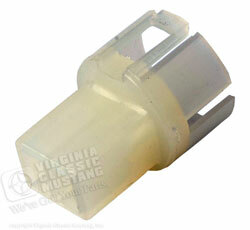 1968-73 Mustang Door Jamb Light Switch Socket. This plastic socket is very brittle and almost always breaks when installing a new door jamb switches. Does not fit cars with Warning Group with door ajar option. Simply install by carefully breaking the old brittle plastic socket apart with pliers to free up the wire leads and plug wire leads into the new socket. Fits 2 wire/prong switch.